For the first time this season, the Providence Bruins have hit a rough patch. The team will carry a four-game losing streak into Friday’s matchup with the red-hot Wilkes-Barre Scranton Penguins, who are going streaking in the other direction, winning seven in a row to take hold of the Atlantic Division lead. The P-Bruins went 0-for-3 on the weekend, managing one of a possible six points. The lone point came in a 2-1 shootout loss to the Bridgeport Sound Tigers on Saturday night. Matt Beleskey took a puck to the face in Friday night’s game, breaking his orbital bone. In what has been a fun season to this point, the Providence Bruins are in the middle of their first real skid. Beleskey’s injury was a tough way for the team to start a three-game weekend. Defenseman Chris Breen was also knocked out for the rest of the weekend in the same game when he was cut on the leg by a skate. According to reports, Beleskey could return as early as this weekend. It would be welcome news for the P-Bruins and Beleskey, whose struggles this season have been well chronicled. He’s appeared to have a positive attitude since clearing waivers and joining the team in mid-December. The P-Bruins could use his presence in the locker room and lineup to get out of the current slump. 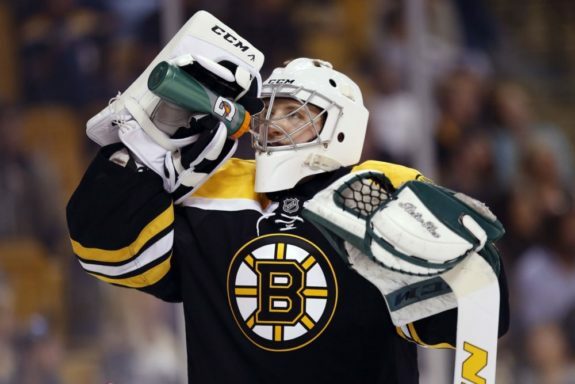 The P-Bruins’ All-Star goaltender Jordan Binnington struggled over the weekend. Binnington has put together a career-year to this point, posting a 1.81 goals against average and .931 save percentage in 15 appearances. In little over four periods of work against Springfield and Bridgeport, Binnington stopped 41 of 47 shots. That’s an .872 save percentage for the P-Bruins most reliable netminder to this point. Zane McIntyre stopped 17 of 18 shots in the shootout loss to Bridgeport. The P-Bruins could use a few more solid performances from McIntyre, the goaltending duo is likely to continue to split time as Binnington is on loan from St. Louis. The P-Bruins have a need for secondary scoring. Kenny Agostino, Jordan Swarz and Austin Czarnik have carried the load for the team over the course of the season, but the trio has combined for just four points combined during the four-game slide. Rookie Ryan Fitzgerald netted the tying goal Saturday night in Bridgeport to send the game to overtime. The P-Bruins will hope the big goal can spark Fitzgerald and help him regain some confidence. The young forward has two points in eight games since returning from a knee injury. Fitzgerald had 11 points in 20 games prior to the injury. Anders Bjork is a recent addition to the P-Bruins lineup that can contribute to a turnaround. 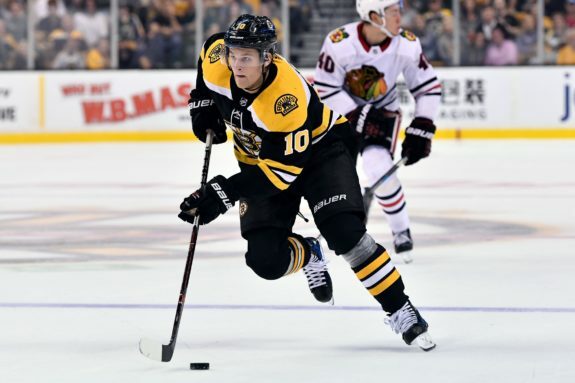 The rookie speedster spent some time on the first line in Boston to start the season, but struggled after returning from a concussion injury. Bjork was scoreless in the two games he appeared in over the weekend, but had two goals and two assists in his first three games as a P-Bruin. If he can regain his confidence and pre-concussion form, it will not only benefit the P-Bruins, but may land Bjork back in Boston with the big club. It’s an interesting time for the Baby B’s to struggle. It would have been more understandable at the beginning of the season when injuries struck the entire organization. The team kept rolling through roster shuffling early on, and currently should be benefitting from a crowded roster in Boston. A 76-game season is long, and the AHL schedule can be demanding on a player. Bus rides, coupled with three games in three days are not easy, although the P-Bruins have made it look easy at times this season. The P-Bruins are still a very good team. Guys like Beleskey and Bjork are key players at this level, and the team played its way into first place without them. Peter Cehlarik’s return from a leg injury is an added boost — he’s a player that has been on the cusp of finding himself on Boston’s roster. They have a solid blue line with a mix of prospects and AHL veterans, and one of the league’s best first lines. It’s a bump in the road, but the pieces are in place to get back on track.